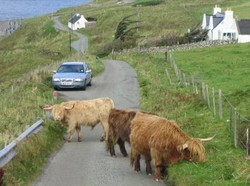 Choosing ways of getting around in Scotland is part of the fun. There are so many ways to see this fascinating country. Hire for Lower is a competitive company. Also check out Hertz Rent A Car, Arnold Clark, Budget and National Car Rental. 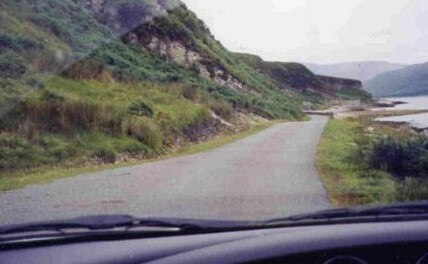 Driving in the more remote Islands and Highlands there are often passing places, (they are often single lane highways)...this is an example.. So now you know what to expect!! 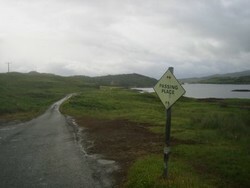 and passing places....at least in the Highlands and Islands.. 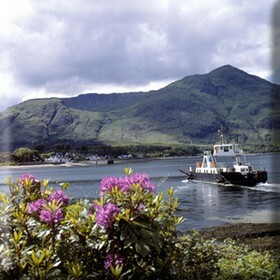 The other delightful means of travel amongst the Highlands and Islands are the ferries. I loved these when I was a child..and still do! You can drive your car onto some of these sturdy boats, then all you have to do is relax, get out of your car and enjoy the passing scenery..and it is beautiful!.. One more thing I must tell you about.... and that is the steam trains! There are several trains and routes to choose from in Scotland but I think this one is probably one of the most exciting.. 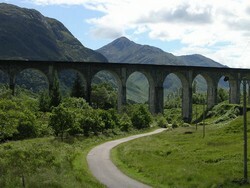 Anyone who's ever seen the Harry Potter movies will immediately recognise the Glennfinnan Viaduct. 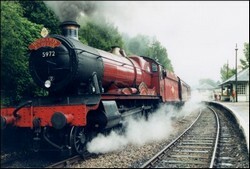 During the summer you can take The Jacobite Steam Train ("The Harry Potter Train - Hogwarts Express!") 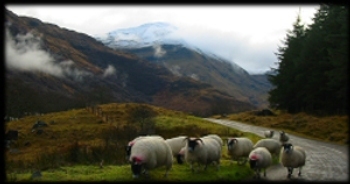 from Fort William past Ben Nevis, over the Glenfinnan Viaduct and along the Road to the Isles all the way to the fishing port of Mallaig. The Jacobite Steam Train is operated by the West Coast Railway Company. Go to their website at http://www.steamtrain.info/ to make inquiries and get tickets. In the cities and towns, the local buses are one of the most reliable modes of travel, and the least expensive. Many Scots regularly use them to commute to work and get around town.. and between towns. 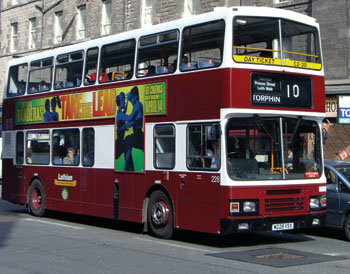 They are often double deckers..another attraction for sight-seers, the young and young at heart. I thought the upper deck was the most exciting form of travel ever invented the first time I rode on a bus! If you arrive by train, there is almost always an available taxi cab to get you to your destination. Often the smaller towns have high streets, suitable for strolling, and many people do their grocery shopping on foot.